* Black Vines kicks of with a loud, bracing burst of black licorice and mint. * It is very fresh and exhilarating – making it a great morning wake-up scent. * Licorice stays as the focus as a mildly sweet vanilla comes in for a short time. * The vanilla seems to quiet it down a little bit and it starts to wear closer to the skin. * A touch of incense comes in at the base, but licorice is still the dominant smell. Summary: If you like black licorice, you will like Black Vines. Longevity is good for an EDP at over 10 hours. With its strong projection, it is definitely more of a night scent and not office-friendly. While I like the scent and enjoyed wearing it, it is not one that I would rush out to buy because the price point seems high for what seems like a pretty simple note. When Victoria of eaumg smelled this on me, she commented it was just like essential oil. Black Vines is definitely worth testing but I would suggest wearing it side by side with the essential oil. In my mind, Fields of Rubus from Kerosene is a bit more complex, just as fun, and much more full bottle-worthy. 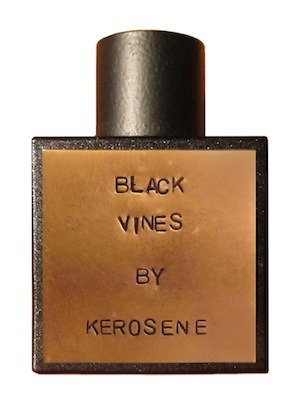 Kerosene Black Vines is available from the Kerosene website, Indie Scents, and Min New York. Disclaimer: sample received from retail store. Image courtesy of Kerosene website.